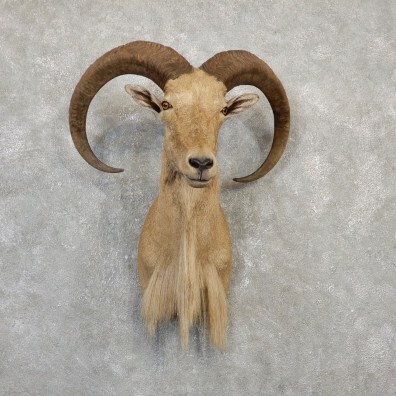 This is a fantastic Aoudad taxidermy shoulder mount! This aoudad features a great set of horns that measure 33 4/8" in length and over 12" in circumference. It also has the classic shaggy hair beard which really captures the beauty of this animal. The hide and hair are both in perfect condition, and the craftsmanship is top notch. 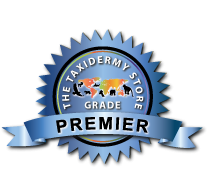 All of this combined had helped this item earn our Premier Plus™ overall quality rating. All applicable dimensions are included to help ensure this item will fit within your intended display space. The Aoudad (AKA “Barbary Sheep") is a caprid species found natively in North Africa but has since been introduced with success to many other parts of the world, including the United States. The Aoudad has been incorrectly called a sheep, as recent studies reveal closer relation to goat species. They are typically sandy brown in color with slightly darker shade running down along the ridge of it’s back. They can weigh in at a hefty 300 lbs, while consuming various types of bush and grass for nutrition. Aoudad usually prefers dawn and dusk for eating and movement, avoiding the sun and high temperatures of mid day.